"The Vegetable Lamb of Tartary (Latin: Agnus scythicus or Planta Tartarica Barometz) is a legendary plant of central Asia, believed to grow sheep as its fruit. 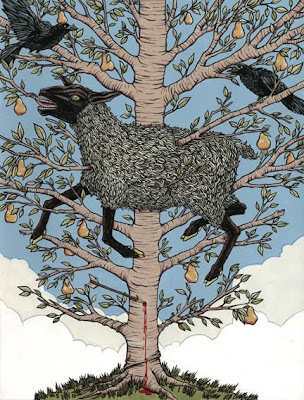 The sheep were connected to the plant by an umbilical cord and grazed the land around the plant. When all the plants were gone, both the plant and sheep died. " a zoophyte, or plant animal, called in the Hebrew Jeduah. It was in form like a lamb, and from its navel, grew a stem or root by which this Zoophyte, or plant-animal, was fixed attached, like a gourd to the soil below the surface of the ground, and, according to the length of its stem or root, it devoured all the herbage which it was able to reach within the circle of its tether. The hunters who went in search of this creature were unable to capture, or remove it, until they had succeeded in cutting the stem by well-aimed arrows, or darts, when the animal immediately fell prostrate to the earth, and died. 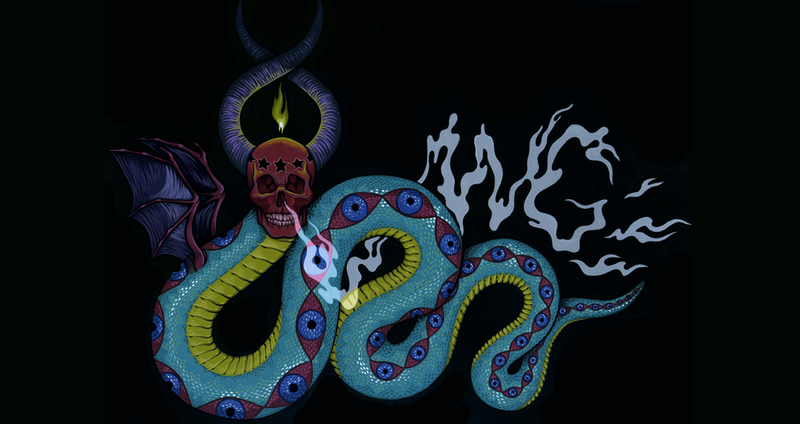 Its bones being placed with certain ceremonies and incantations in the mouth of one desiring to foretell the future, he was instantly siezed with a gift of divination, and endowed with the gift of prophesy." "
"Twrch Trwyth is a particularly potent wild boar in the Arthurian legend. The hunt for Twrch Trwyth by King Arthur was the subject of a popular stock narrative in medieval Welsh literature. The fullest account of this great hunt appears in the prose tale Culhwch and Olwen, probably written around 1100, but other references demonstrate that this was a popular subject in Wales for hundreds of years. Both the boar and the hunt have parallels in earlier Welsh and Irish mythology. Twrch is named as the son of Prince Tared, cursed into the form of a wild creature; he has poisonous bristles, and carries a pair of scissors, a comb and a razor on his head, between his ears." The first piece was actually in the Best of Benna's show in April and had sold so I hung an archival print in the Snyderman show. 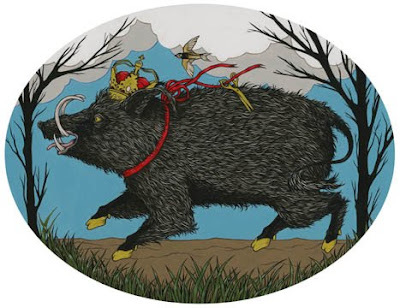 The boar is new and was done in 5 days (of non-stop painting) as I was a late addition to the show. Both pieces are in really beautiful custom frames made by Josh Robeson (I'll include pictures of them framed at a later date probably). You should 100% ask me for contact info if you are interested in having a really nice frame made by a Philadelphia artist, because he does incredible work! There's a lot of detail lost in posting these so small but it's a limitation of the blog format. Hopefully you get the idea! UPDATE: READ A REVIEW OF THE SHOW HERE! they chose to highlight one of my pieces and I'm pretty excited about that! 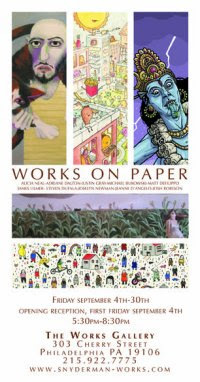 Snyderman Works on Paper Show-I'm in it! "The Works Gallery is proud to present a show composed of ten local artists; Alicia Neal, Adriane Dalton, Justin Gray, Michael Bukowski, Matthew DeFilippo, James Ulmer, Joslyn Newman, Steven Dufala, Jeanne D'Angelo & Josh Robeson. This is the first show of Works on Paper at the Works Gallery and also the first show curated by Kathryn Moran. The show opens First Froday, September 4th and runs through September 30th."